Well, I can tell you that in Aug.'41 they were overall light gray. I believe Oct. '41 is when they went to the two toned scheme. Last edited by Jeff Sharp on Thu Jun 07, 2018 7:45 pm, edited 1 time in total. Awesome, thanks guys... the "two tone" scheme as I understand it is the blue/grey scheme I've seen on most of the early wartime planes - is that right? Did this scheme retain the "9-CS-x" markings (which denotes the xth aircraft of VCS-9, etc) or did they switch to something else? 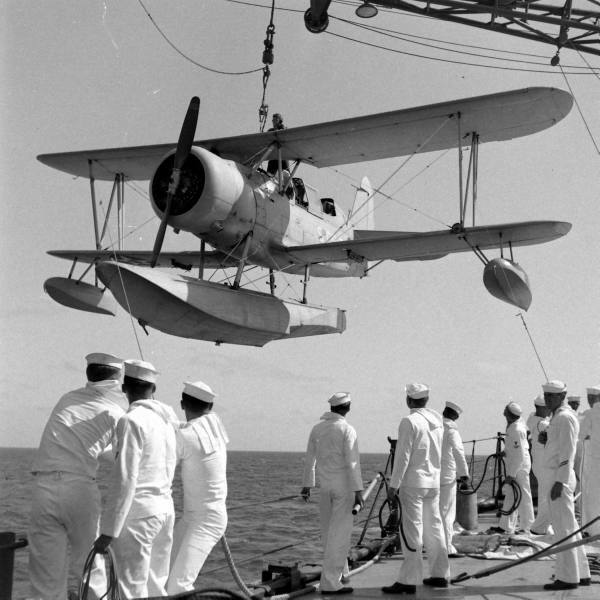 I'm not an expert on USN aircraft markings and the timing of changes. Dana Bell would be the best person to answer these questions. However, I can say that at least by September 1941 (maybe earlier?) 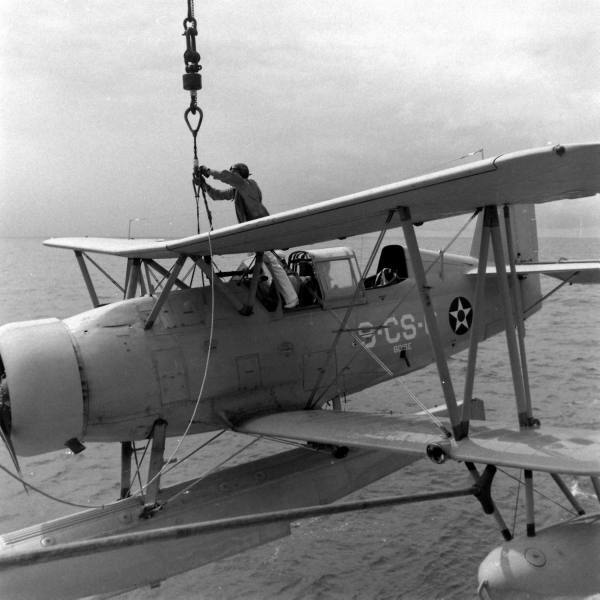 the paint scheme changed on USN aircraft to the Blue-Gray top surfaces and Light Gray on the underside based on a photo of USS ARIZONA I scanned dated in early September 1941. As for unit markings, they were still carried as was done in late 1941 well into 1942. 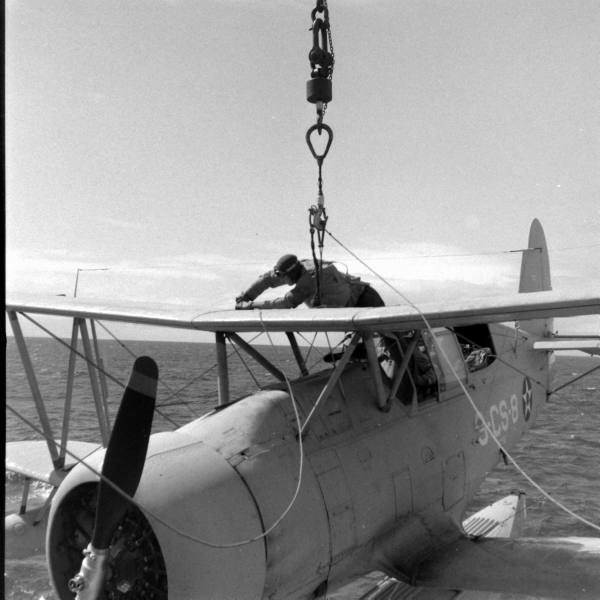 I know from photos I have that they started to simply number the aircraft like "1", "2", etc depending on how many were carried. I think as much because crash losses caused a rapid turn-over in aircraft carried onboard. It appears that the markings were painted in either black or some other lighter color. The fantail of USS BROOKLYN from that same 8 December 1941 "dated" photo that I posted a cropped view of the bridge area. 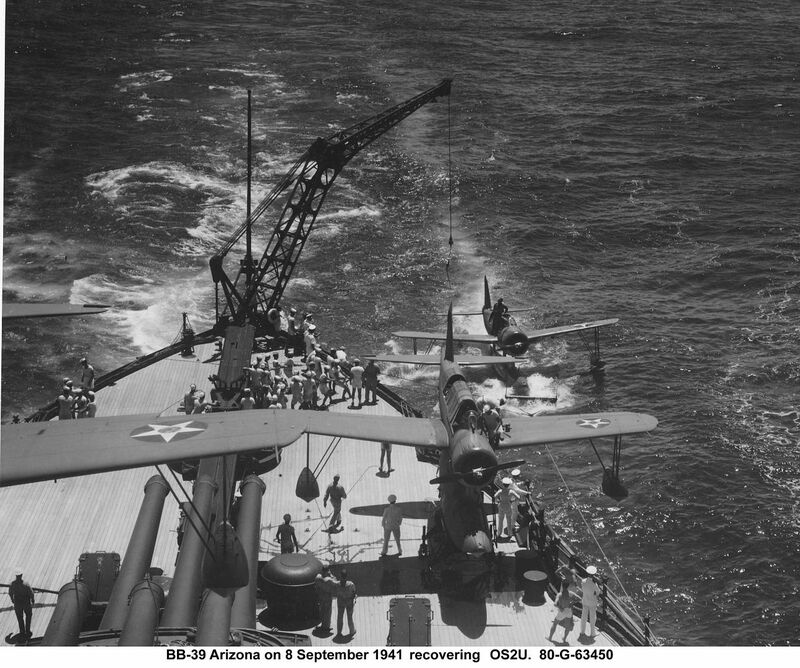 USS ARIZONA recovering aircraft in a photo dated 8 September 1941. The aspect angle of this view doesn't allow seeing the unit markings on her aircraft, but the new colors are quite apparent. Additional views of this sequence of photos that can be seen on Navsource, do show aircraft unit markings in black. Did this scheme retain the "9-CS-x" markings (which denotes the xth aircraft of VCS-9, etc) or did they switch to something else? They kept the markings but changed the color from white to black. 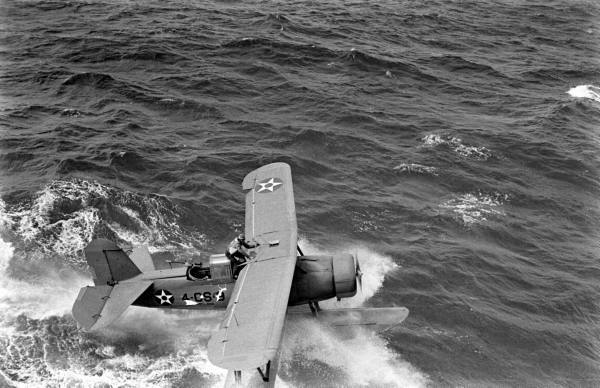 Here are a couple of pics of Portland's planes on 12/7/41. Last edited by Jeff Sharp on Thu Jun 07, 2018 7:50 pm, edited 1 time in total. It looks like there is a photo of a 20mm Oerlikon on Helena that has a rounded shield on the front of it. I looked at the image for a while, to see if maybe it was just bent. And it does not look like that is the case. It looks like it is a rounded shield on the Oerlikon. I wonder if others were like this? Have seen that too - but not any other photo I can remember. Therefore I thought it would be damage. I suspect that the "bent-back" gun shields on the starboard stern 20-mm gun, was caused by some sort of battle/sinking damage or structural deterioration from supports rusting. Having the shields bent back in that manner would have made reloading a real pain for the crewman tasked with that duty. 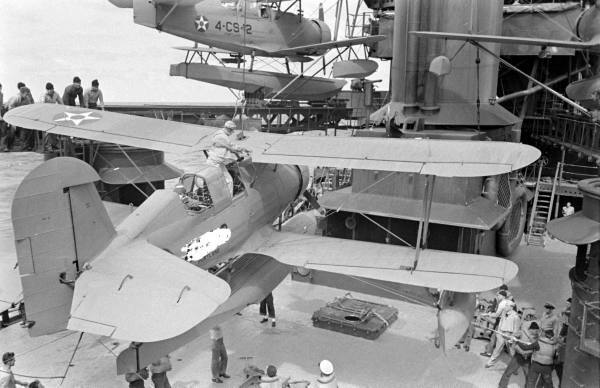 Photos of USS HELENA at MINY in June 1942, shows shields on other 20-mm guns onboard installed in the conventional manner. The gapping hangar well is tempting as well. Other than the bow - where else would they put the hull number? I can't figure out what part of the ship this is. 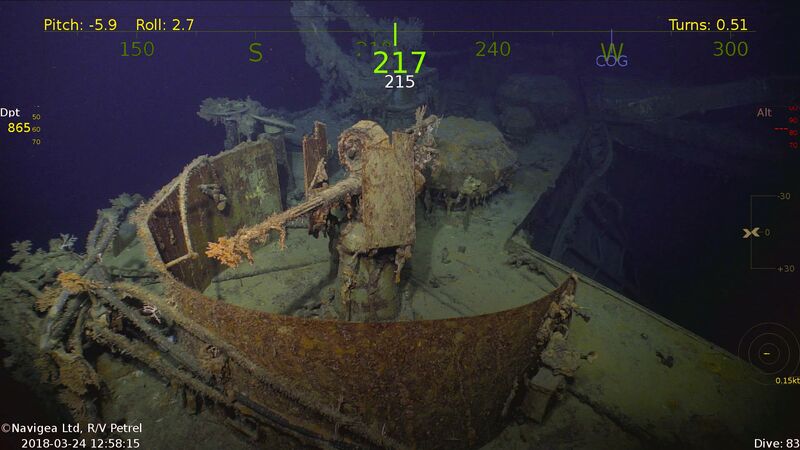 Helena is described to have lost her bow by the first torpedo hit - perhaps therefore this part is not easy to identify as part of the bow? However - the # seems to be far too close to the deck. Its right under the closed chock. 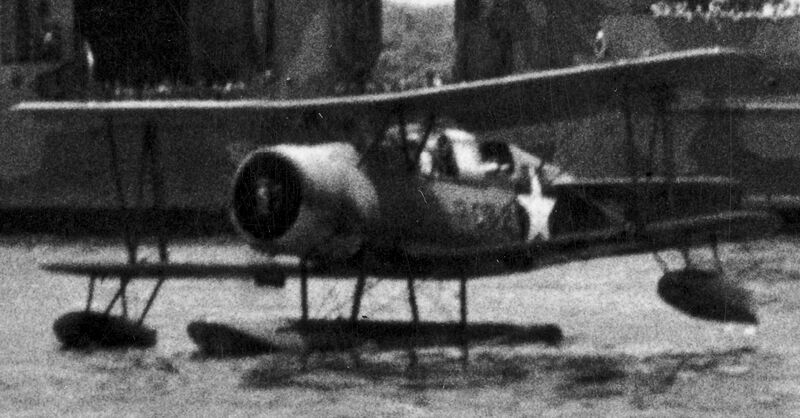 In the pics I found closest to the sinking (1943), the # is that close to the deck, or any closed chocks, bitts or bollards. Just curious. Never mind - figured it out. Looks like they put it on the stern as well. It's the stern. The shape above it is a splinter shield for a 20mm Oerlikon. 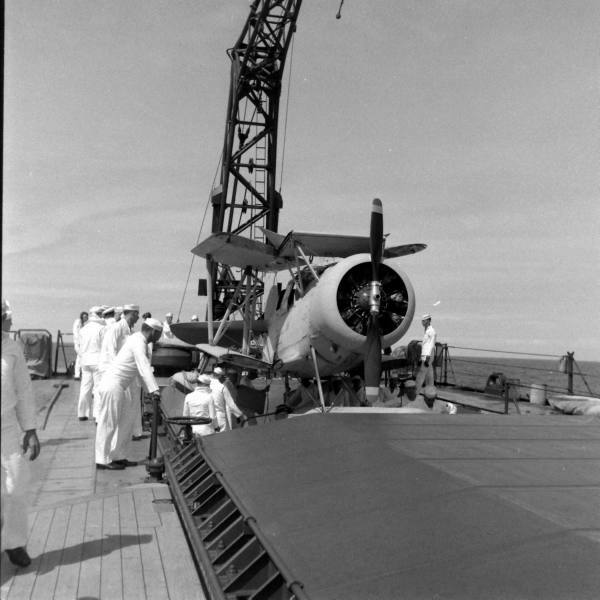 The object in the extreme background of the photo is the remnants of the airplane handling crane. 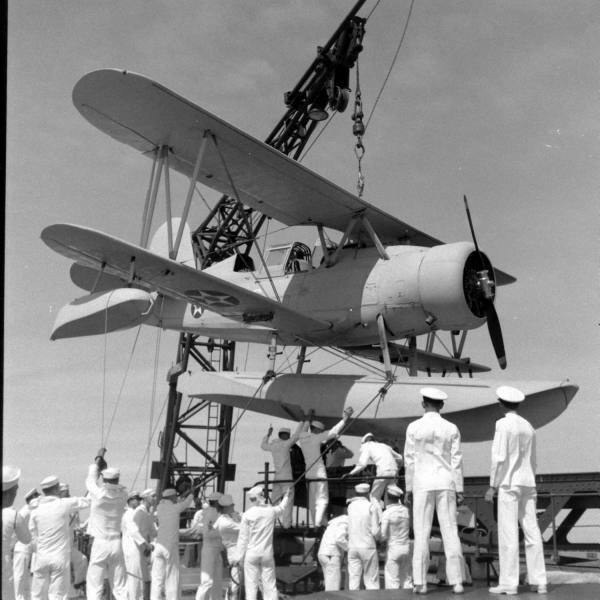 Gents - any idea if Nashville (CL-43) was painted in the new Navy Grey (5-N #7) in 1945, after the refit to repair kamikaze damage? I assume she was - since it appears the ship was at the Puget Sound Navy Yard, and from what I've read here the west coast yards got the new formulas first. The Shapeways vendor COB Constructs and Miniatures is now offering a 3D-printed St. Louis/Helena class cruiser. As many here know, these were a sub-class of the Brooklyn that had significant differences in turret placement from the rest of the class, etc. With some work, one could modify this printed model to possibly make one of the earlier members of the original class. That St. Louis/Helena has a lot of problems with it. The secondary turrets are mounted on some sort of shelf, when the hull sides came all the way up to the base of the 5" turrets where they were mounted. The face of the bridge looks weird, as do the stacks. And it looks like it is printed as all one piece. Overall it isn’t bad as a semi-scale model. But it would be a bugger to make anything realistic out of it. And it is only in White Natural Versatile Plastic quality, which requires a lot of work. There is a much better kit of USS Helena by Niko Models available. Niko Models also have a lot of different variants of the Brooklyn class plus there is the early version of the class by Corsair Armada. Well, a lot of the people who read this thread are already well aware of the various Brooklyn/St. Louis class kits there, such as this Niko 1/700 Boise which seems to be the only available member of this class on Ebay at this moment. However, if you look at the listing in the embedded link from L'Arsenal's Ebay store, the cost of this kit is about 69 Euros or 106 Canadian dollars (about 81 US dollars). Compare to this to Freetime Hobbies' listing for the Niko USS Savannah kit, which is only about 69.95 US dollars. My point is that these resin kits, while detailed and accurate, are more expensive. While COB Constructs and Miniatures' 3D-printed models are imperfect in many ways, their St. Louis/Helena is only about 33 US dollars. Also, I seem to recall there were also Midship Models kits of the Brooklyn/St.Louis class, such as the Helena kit, although all are obviously out of production. I regret to say that my Corsair Armada kit is currently out of production for upgrades and revisions. I don't have a date for reissue. It's still in the early stages.